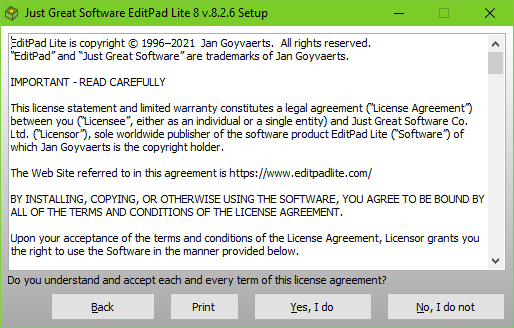 If the setup package comes with a license agreement, it will be displayed right after clicking the "Immediate Installation" button on the welcome screen. It will appear after the component selection screen with all the other installation options. If no license agreement is available, this screen is skipped automatically. If the application was already installed, this screen may also be skipped if that option was selected on the Project page when building the installer. If the license agreement is not accepted, the setup will terminate immediately. After the license agreement is accepted, DeployMaster will either ask for the user's identity or start the actual installation right away if no identity information is needed.